· assist in the creation of policies that foster self-determination among indigenous peoples. Native Lands was founded in the late 1980s as the Central America Program of Cultural Survival, an indigenous rights organization based in Cambridge, Massachusetts. Initially, our program consisted of a small grants fund to support the activities of local groups, with emphasis on territorial defense and the management of natural resources. We spent considerable time in the field during this period, visiting communities and talking with people about their problems and aspirations. This was a valuable learning experience that served as a sound foundation upon which our program developed over the next decade. In the early 1990s, we became an independent non-profit organization, the Center for the Support of Native Lands. In 1992, Native Lands undertook two cartography projects that marked an important step forward in our work with indigenous peoples. The first was a collaborative venture with the National Geographic Society on a bilingual Spanish-English map titled The Coexistence of Indigenous Peoples and the Natural Environment in Central America. Published as an insert in the journal Research & Exploration, it was widely distributed and had a powerful impact in both the indigenous and environmental sectors in the region. 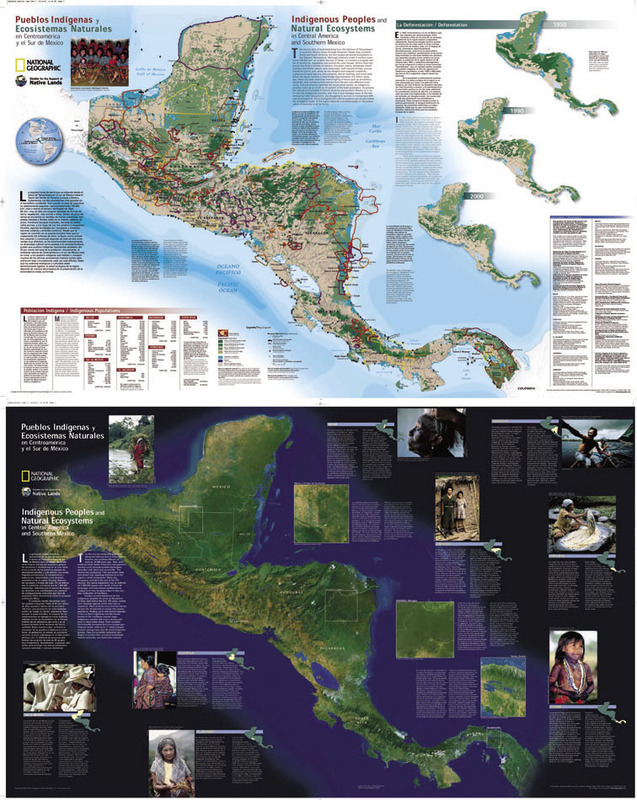 This map was followed 10 years later with a second map, Indigenous Peoples and Natural Ecosystems in Central America and Southern Mexico, again done in collaboration with National Geographic. Also bilingual Spanish-English, it encompassed the entire Maya region, including southern Mexico, and included both terrestrial and marine ecosystems. It was distributed as an insert in the February 2003 issue of National Geographic en Español throughout Central America and Mexico. The second cartography project was a participatory mapping effort with five ethnic groups in the Honduran Mosquitia, the most remote – and heavily forested – region of that country. Carried out with two local organizations – MOPAWI and MASTA – the project documented the land use areas of more than 170 communities and served to halt foreign timber concessions and colonization programs and lay the groundwork for indigenous claims for land rights. This was the first of a series of similar projects with indigenous groups in Latin America – Panama, Bolivia, Brazil, Suriname, Guatemala, and Nicaragua – and later in the West African Republic of Cameroon, Indonesia (West Papua), and Papua New Guinea. The objectives of these projects have been to claim and defend traditional territories, strengthen political organization, to document cultural histories, and to better manage natural resources. A narrative account of our earliest mapping projects in Honduras, Panama, and Bolivia can be found in Indigenous Landscapes: A Study in Ethnocartography by Mac Chapin & Bill Threlkeld (2001). This book also contains a description of the methodology that Native Lands has been developing for mapping indigenous lands. We also became involved in the collaborative organization of conferences, workshops, and technical exchanges during the 1990s. In 1996 we joined with two Honduran organizations -MOPAWI & MASTA – to organize The First Indigenous Conference on Land, Environment, and Culture in Central America, and this was followed by a series of regional workshops on indigenous territories, sustainable development, protected areas, and cultural identity. In 1999 we collaborated with two Salvadorean organizations – CCNIS & the Jefatura de Asuntos Indígenas of the Ministry of Education – to hold The Second indigenous Conference on Land, Environment, and Culture in Central America and Southern Mexico. Our current program features our community mapping work, with on-going projects in Papua New Guinea (with the Woodland Park Zoo in Seattle, Washington, and the PNG University of Technology) and West Papua (with the Department for International Development – DFID). We are also in the process of writing a guidebook for the mapping work and expect to have this finished by the end of 2006. Native Lands’ major task this year is an in-depth study of the relations between donor agencies and indigenous organizations, with a focus on Latin America. It is a collaborative effort with First Peoples Worldwide (FPW) and Oxfam America. It aims to understand the dynamics of this complex – and difficult – relationship and emerge with recommendations on how it may be improved.